Because nothing says "vacation" like spending eight weeks attempting to survive the deadly waters off Antarctica, get ready to unwind on the Shackleton Epic, an authentic re-tracing of Sir Ernest's polar expedition. 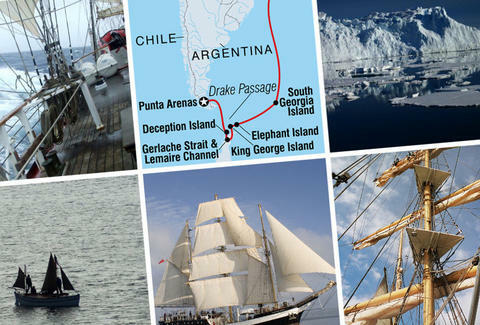 You'll accompany 10 modern-day explorers on an 800-nautical-mile sailing journey as they reenact the footsteps of a bunch of dudes who would have frozen to death were they not too busy becoming delirious from starvation, making theirs "one of the greatest survival stories in history" (at least according to your girlfriend, because there's no way you can tell her about Cancun Spring Break '04). While the real action heroes rough it aboard a replica of Shackleton's 23' lifeboat with only turn-of-the-century equipment (reindeer sleeping bags! ), you'll stay in one of 10 "guest" berths on the support vessel: a fully restored barquentine w/ satellite comm, warm bunks, "hot delicious meals", and plenty of Mackinlay Whisky distilled just for the expedition. After a few days practicing knots and learning to sail in Patagonia, you'll head south past Cape Horn, exploring calving icebergs and wildlife throughout the South Shetland Islands before heading out to sea. Whenever the reenactment team sets out for a grueling overland trek, you'll laze about learning of Antarctica's wildlife and icemelts, only pushing yourself when you eventually disembark in Rio, also known as the party capital of the world... but only to anyone who didn't see you at Senor Frog's in '04, brah.